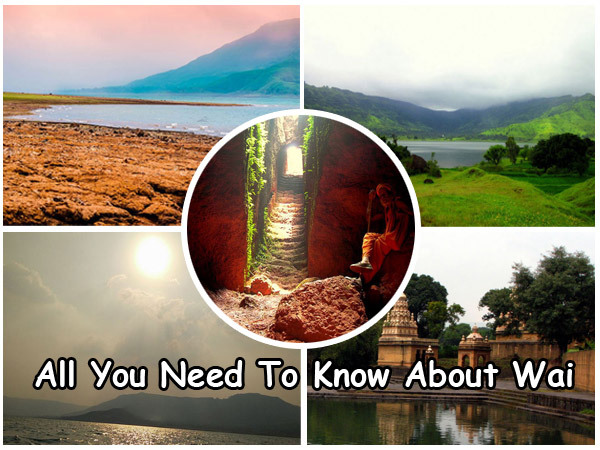 Since a long time, Wai has been always seen under the shadow of Mahabaleshwar and Panchagani. These hill stations in the Sahyadri ranges are an all time favourite of the tourists. However, Wai cannot be simply written off, as it has a lot of potential to attract tourists with its lanes that would remind you of the glorious years of the Peshwas. Wai was also known as Viraatnagari, as it was believed that the Pandavas stayed with King Viraat of Wai, when they were in exile. An important centre for business and commerce with traders heading towards Satara and Kolhapur or the port of Konkan. A popular temple town with mythological links, it is also a favourite tourist destination because of its scenic ambience and the fact that it can be a stopover on the way to the hill stations of Panchgani and Mahabaleshwar. With more than 100 temples, it is known aptly as the Dakshin Kashi, and to top it all, it is also the place where some of the biggest Bollywood blockbusters have been shot. By Air: Lohegaon Airport of Pune is the nearest airport to Wai, which is located at a distance of 66 km away from Wai. There are regular flights to Pune from all the major cities in the country. By Train: Wai does not have a railway station of its own, the nearest rail head is Satara which is about 40 km away. By Road: Wai is well-connected by roads. It is located at a distance of 230 km from Mumbai, 66 km from Pune and 764 km from Bangalore. There plenty of buses operating from Mumbai, Pune and other major cities regularly. At a distance of 35 km from the city of Satara, Wai is truly a pilgrim town with almost 100 temples.Most of them are constructed in the Hemadpanthi style of architecture which uses huge stone slabs and without mortar. The most well-known temple here is the Dholya Ganapati Temple on the banks of the river Krishna on Ganapati Aali Ghat. Known for its design and grandeur, it was built in 1762 by Ganpatrao Bhikaji Raste. It is located within the six forts of Pandavgad, Kindergad, Kamalgad, Varaitgad and the twin forts of Cahndan and Vandan. The forts are a trekker's paradise;they are not completely ruined and offers a panoramic view of the hills and valleys. A legend says that when Afzal Khan had set out from Wai to kill Chhatrapati Shivaji, a local named Shende Shastri prayed to river Krishna for the King's victor. Shivaji emerged victorious and killed Afzal Khan, from then on the river was seen as the goddess Krishnabai. To mark this victory every year an annual festival is celebrated. A week long celebration takes place on each of Wai's seven ghats. The wada is a large six quadrangular, perimeter protected mansion which was completedin 1780. Nana Phadnavis built this mansion with an inner courtyard and also a ghat which leads from the mansion to the Krishna river. The architecture is perfect example of typical wada built during the Peshwa era which has a ghat and a temple along with the main structure. There are two temples constructed one dedicated to Lord Vishnu and the other to Lord Shiva. The Phadnavis wada is one of the best preserved buildings in the area. The temple built in the Hemadpanti architecture by Raja Bhoja in the 17th century. Dedictated to Lord Ganesha, it was built to protect the town of Wai, from any sort calamity and from enemy attacks. The temple gets its name from the size of the deity, which measures to 10 ft in height and 8 ft in width. Dholya in translation means huge, hence the temple is called Dholya Ganapati. Perched on a hill at 4650 ft above sea level, is the temple dedicated to Mandhardevi. According to local legends the temple s believed to be more than 400 years old, and was built during Shivaji's rule, but there is fixed date ascertained to the construction of the temple. Devotees attribute miraculous powers to a grove which is around the shrine. The temple overlooks the beautiful Purandar Fort. A group of nine caves, which are known for its architecture which follows the Vastu Shastra. The caves were associated to Buddhism, but now many sections of the caves have been converted to a temple dedicated to Lord Shiva. There are ample options for one to stay and eat at this place. You would find places to stay from pocket-friendly ones to the ones which can burn a hole in your pocket. There are also a number of resorts which offer you a very good place to stay and variety of food.